using and understanding all the nonverbals of communication; eye contact, facial expressions, gesture and voice. These challenges can make it difficult for us to answer questions such as: What is valuable to this child or adult? What makes sense and makes her or him feel a sense of belonging? How can our shared activities catch the other person’s interest in a way that makes the activity intrinsically motivated? How do we provide the opportunity for the other person to take initiatives reflective of his or her own intentions? Even if these questions are difficult to answer, we should not stop searching for the answers. I believe that these are the important questions and that they are central to feeling valued, having a sense of belonging and engaging in the social world. I believe that our search for answers should should begin with seeing and appreciating the intrinsic value and meaning of the activities, expressions forms, interests and preferences of children and adults on the spectrum. That is, seeing the value and meaning of flapping your hands, using your voice in a particular way, touching water, discussing the order in which to watch Dr. Who, looking at sand passing from one hand to the other, making lists of film titles, or indulging in facts about the solar system. In my master’s thesis (later presented as a poster at the Lancaster Disability Conference), I concluded that the interests, sounds, movements and preferences of the individual person should be the starting point for the approaches we use in research, therapy, family counselling, education etc. This put me on a search for approaches to autism where this recognition was the foundation. I was looking for approaches that fully recognized the meaningfulness and value of these special interests, preferences and forms of expression. Almost by accident, a marvellous professor of developmental psychology, Vasu Reddy of Portsmouth University, mentioned Intensive Interaction, an approach developed by head teacher Dave Hewett, teacher Melanie Nind, and colleagues at Harperbury Hospital School in the 1980’s. When I started reading about it, it didn’t take me long to realize, that this was the approach, I, unknowingly, had been looking for. 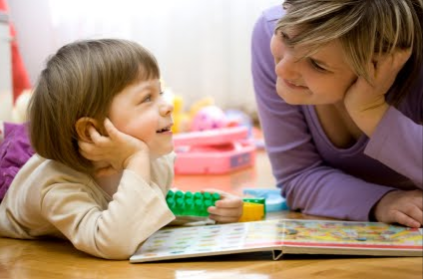 Intensive Interaction consists of repeated, simple activities in which someone learning about communication gets the experience of taking part in meaningful two-way communication with a more experienced communication partner, typically the parent or professional. In all its simplicity Intensive Interaction is built on parent-infant research. This research shows us, that we typically develop communication very early in life through enjoyable, simple, repeated social interactions. 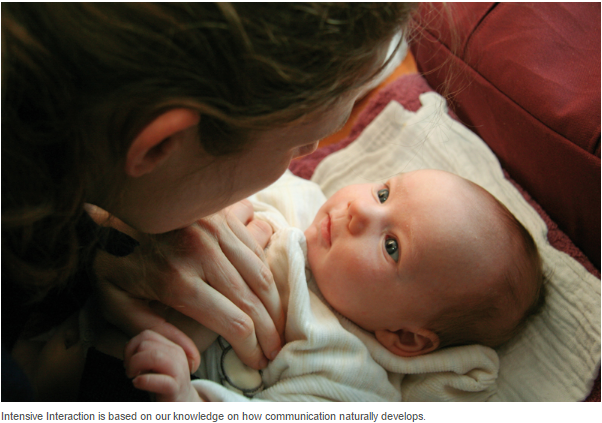 In these interactions the least experienced communication partner (in infant research that means the baby) gets to take the lead most of the time, while the role of the more experienced communication partner (in infant research: the parent) is to sensitively respond to and reflect back what the baby just did. This often happens through imitating or repeating some aspect of what the infant just did. Early communicative development requires of the more experienced communication partner to build the flow and content of the interactions on whatever the least experienced communication partner contributes. Most of us know this intuitively from ‘talking’ to infants and babies. In the 1980’s, Nind, Hewett and colleagues applied these findings from infant and developmental psychology to their work with quite severely disabled young people at Harperbury Hospital School. Through action research they developed and refined their communication work, and ended up with now known as Intensive Interaction. Their research question was this: “How do principles from infant research apply to people who certainly are not babies, but who, none the less, have a big need to develop the very earliest communication?” What they discovered was that many people with communicative disabilities often do not have access to the kinds of experience that could develop the most crucial aspects of human communication. They often have limited experience with participating in a shared world, expressing emotions, making sense of the world with other people, participating in turn-taking and shared activities, using eye contact, facial expressions, gesture, meaningful use of the voice, regulating arousal etc. What the staff at Harperbury Hospital School did was to develop an approach that gave their student access to developing these crucial things. The developed an approach to make sure that early communication can be established, promoted and developed when it doesn’t happen by itself. The approach is used widely in both educational and other professional settings as well as by parents and other family members in the UK, and increasingly, in other countries around the world. 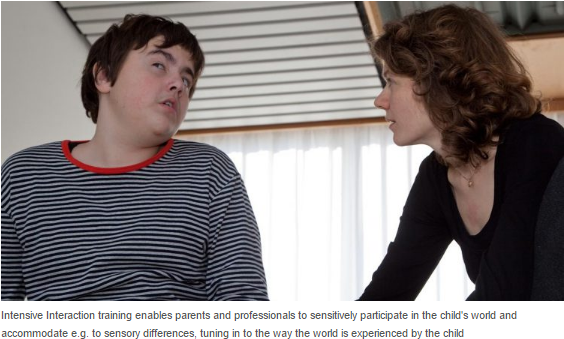 Why is Intensive Interaction such a Special Autism Approach? Most people learn these skills before they reach 18 months, and they use them throughout their lives. In all other learning and communication, people tend to use (and enjoy using) gaze, face and gesture while communicating. They sense the physical proximity to others and they attune themselves to the person they’re speaking with. But in autism, this learning might not be easily accessed due to (among other things) atypical interests, preferences, forms of expressing yourself, social anxiety, sensory sensitivity and overload and weak, brief or atypical signals that aren’t picked up as easily. 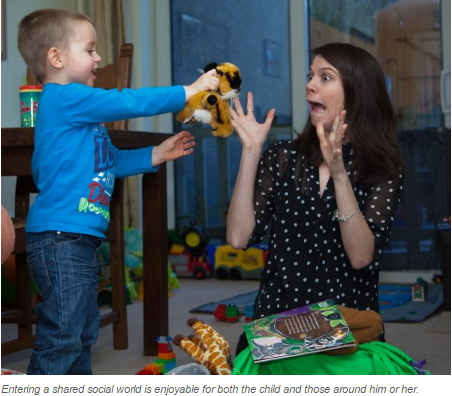 How Does Intensive Interaction Help Children on the Autism Spectrum Develop? 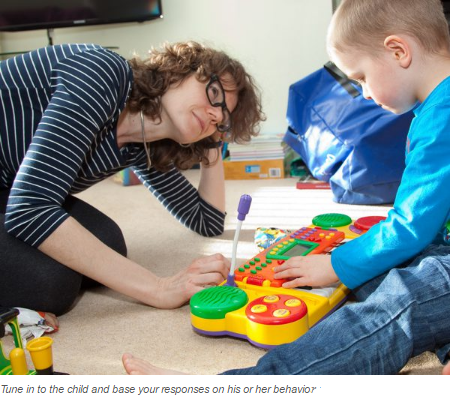 In Intensive Interaction we start paying close attention to any and all signals from the child, and we try out ways of responding to what is happening right now, acknowledging signals that might have been overheard previously. And over time, this helps the child be more confident in his or her ability to communicate. Letting the child lead allows him or her to take new steps and engage more fully in the very activities that promote communicative development. Intensive Interaction, thus, is aimed at the core challenges that autistic children and their families face; promoting the fundamentals of communication, giving access to a shared, meaningful world. The way these skills are learned in Intensive Interaction is designed to give the child a sense of influence, efficacy and control. This is a good thing, because when you have challenges in communication you are usually at risk of having less influence, having others direct you, instruct you, make decisions, and take the lead. Intensive Interaction provides the child with the opportunity to influence the content, flow, intensity, length and rhythm of the interactions, thus beginning to sense the joy, value and confidence of being an equal (though less experienced) communication partner. How Do You Do Intensive Interaction? 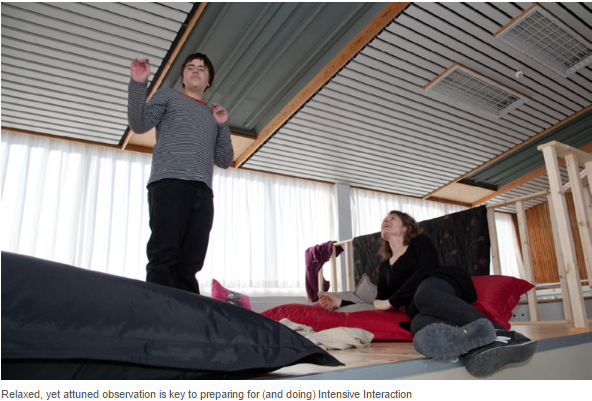 Intensive Interaction is about providing access to this kind of experience. This means that you, as a parent or professional, apply the core principles of Intensive Interaction in regular, repeated, enjoyable activities where the autistic child gets to take the lead and make initiatives (even if those can be quite brief or vague in the beginning). This means holding back your own behavior so that you can respond to something that the child is doing. Make yourself available, accessible and responsive. Typically, an Intensive Interaction activity will start with you finding somewhere nice and near the child to be able to observe him or her. You could sit on the floor and just observe what she’s doing. Start tuning in to the child and his or her actions; see if you can notice what she finds interesting. What is the rhythm, feel or pulse of her movements, how does she look at things, what aspects of materials or physical surroundings catches his interest? When you feel ready, try to give a simple, soft response e.g. by joining in with the activity, repeating some of what the child just did or, softly saying the same sound or tapping the same rhythm. If this catches her attention, you might repeat your initial response, or, if she looks your way, you could respond with an open, smiling face to acknowledge that. Sessions should also be recorded to allow for video analysis of sessions and progress. What Will the Activities Look Like? Activities can be gentle, calm, fun, wild, slow or fast. This all depends on the child you’re interacting with and on the way the interaction unfolds. The idea is to create sequences of actions led by the child. To give the child the opportunity to be seen, heard and get meaningful responses. This creates shared activities, turn-taking and exchanges of all the nice and pleasurable aspects of social, human communication; eye contact, facial expressions, shared understanding etc. Allow for lots of relaxed time, pauses and a slow tempo. This gives the child plenty of space and time to explore and experience what is going on. It allows her to notice how everything is built on something that he or she did; something that made sense to her. This helps the child take initiatives and, along the way, engage more fully in the interactions. So instead of asking the child to join “your world” you are sensitively looking for small signs, that you are being invited in to his or her world. What Should I Respond to? When you try to respond, make sure that your response is based on careful observations of what the child is doing. Therefore: pay attention to the content, rhythm, tempo, intensity and emotional tone of what he or she is doing. When you really notice these aspects (or even just some of them) you are more likely to to give a response that the child perceives as a response. And when this happens; when your response is noticed as a response you are powerfully sending this message to the child “I heard you. I saw you. What I saw mattered and made me curious.” This is a message we all need to develop our communicative competence and confidence. To become a good communicator we need to receive the very reassuring message that we already are. Your ‘job’ as an Intensive Interaction practitioner, then, is simple, yet profound. You observe, wait, pause, respond and gently build interactions with the child’s own inputs as the starting point. This is simple (though not always easy), yet, at the same time you are actually applying a very deep and profound knowledge from infant/developmental research: communicative ability, repertoire and confidence comes from being seen, heard, acknowledged and responded to. Developing communication requires that we realize and believe that our actions, sounds, movements, interests, expression forms, preferences etc. matter to others and make a difference. It is a good idea to make a time to be able to focus 100 percent on practicing Intensive Interaction. Obviously social communication shouldn’t be limited to “Tuesdays between 9am and 10am”. However, if time for Intensive Interaction isn’t in some way prioritized in daily planning, it can be difficult for the communication skills to develop. In both professional and family settings, Intensive Interaction is a focused, yet relaxed practice-learning process that makes it possible to create a natural, relaxed, social environment in which the child can begin to participate more fully in social interaction and communication, and through this, develop his or her skills day by day, week by week, year by year in a spiraling, free-flowing process. The First Attempts-What Can I Expect? If you’re working with someone who is quite isolated or has a very limited social communication it may take some time before you notice any changes. Don’t give up. As a parent or a professional, your first recordings may show you sitting on the grass while the child is absorbed in tearing off leaves, only occasionally glancing briefly at you. Or they’ll show you being allowed to hand over a plastic animal for the child to put in a row. Don’t worry. This is time spent showing the child that he or she is enough. And it is times spent respecting his or her need to very slowly open up to the world outside. In this phase your main objective will be to relax a lot (in an attentive, attuned way) and then, during video analysis, notice all the small signs of interest, emerging participation, and development. On the other hand, although initial progress can be slow, it can also be the case, that change happens fast. In fact, it can be quite overwhelming, when you start doing Intensive Interaction with a child who has “just been waiting” for Intensive Interaction. But it did. This small person developed, quite rapidly, a quite extensive communicative repertoire through the Intensive Interaction work that was carried out with him. He appeared more relaxed, clear in his intentions, insisting on social interaction, using more of his verbal language, developing games that he started playing not only with the ones doing Intensive Interaction with him but with other adults and children at the place where he lived. We may think that people with communicative disabilities like autism have chosen limited participation and engagement. But I have yet to see a child or an adult who doesn’t want participation more than anything, as long as that means access to an understandable, pleasant, stimulating, interesting, responsive social world. I can also highly recommend Sara Moroza-James (2015) Learning Through Social Connection: How Intensive Interaction Can Help Your Child with Autism Learn More Naturally in which Sara explains more thoroughly how Intensive Interaction can help children with autism learn. The book is based on Sara’s extensive experience with using Intensive Interaction with her son, Tom, as well as her training as an Intensive Interaction-coordinator. The book can be read and downloaded from here. On Facebook you can find groups for intensive interaction users, parents’ groups etc. Ditte Rose Andersen is a licensed psychologist with 16 years of experience within the field of autism, communication disabilities, and special education needs. She learned about Intensive Interaction in her search for more person-centered, respectful and curious approaches to autism. Today, she is the Danish associate of the Intensive Interaction Institute, and in 2014 she founded Intensive Interaction Denmark, aiming at providing training, courses and individual counselling to Danish parents, relatives and professionals wanting to learn about the approach. She has presented at the International Intensive Interaction conference in 2014, contributed to the e-learning module on Intensive Interaction by Open Future Learning, US, and has taught with Dave Hewett. Ditte is also contributing a chapter to a future book on implementing Intensive Interaction in different settings edited by Mark Barber and Graham Firth. Thank you for visiting educationandbehavior.com, a free resource for parents/caretakers, educators, and counselors! Browse our topics from the navigation bar above!